Need a Drive Belt Inspection? How Much does a Drive Belt Inspection Cost? All motor vehicles possess at least one drive belt, some have up to four, depending on the number of accessories fitted to the engine. The serpentine belt, or drive belt – also known as a V-belt – is what connects auxiliary components to the engine crankshaft pulley, and is made of a rubber construction with nylon weave for a strong construction. Without drive belts, your alternator would not be able to provide charge to the battery, your power steering would fail to operate, and your car may even overheat! These components are critical for safe operation of your vehicle, so every drive belt must be inspected at regular intervals, to ensure it is in good working condition. The high temperature of the engine bay can cause the belt’s rubber to crack and perish over time. If it is not replaced, it can lead to breakage of the belt and failure of the power steering, alternator, water pump and air conditioning system. How does a Drive Belt Work? The drive belt connects to the crankshaft of the engine to provide drive to accessories fitted to the vehicle. The rubber belt runs from the harmonic balancer over a pulley on the accessory to be driven – power steering, air conditioning compressor etc – and transmits the rotation of the crankshaft when the engine is running. When a drive belt is worn out or requires adjusting, you may hear a high-pitched squeaking noise coming from the engine. This is the belt ‘slipping’ on the components that it is supposed to be running the power steering, alternator, water pump and air conditioning system. Not only is it embarrassing, but may also mean that the components are not receiving the full power that is required to drive safely. This can lead to heavier steering, a flat battery or overheating of your vehicle. If the belt is slipping badly or failed altogether, your battery light may come on. This means that the alternator is not charging correctly and the car is running on battery power alone. This could mean that your car may not start again, if you switch it off, you’re left stranded. Depending on the layout of your vehicles drive belt system, a failing drive belt may cause the power steering and air conditioning to malfunction. If the power steering fails when the vehicle is moving, it could lead to serious safety issues, or even an accident! Cracking and fraying of the drive belt, uneven wear and excessively worn or damaged ribs all indicate that it’s time to have your belt replaced. How is a Drive Belt Inspection performed? Our mechanics will inspect the accessory drive belt system, including the belt, the idler pulleys and tensioners (if applicable) as well as the accessories that the belt runs on. If any repairs or replacement is required, a quote will be provided for all work needed to return the system back to manufacturers standards. 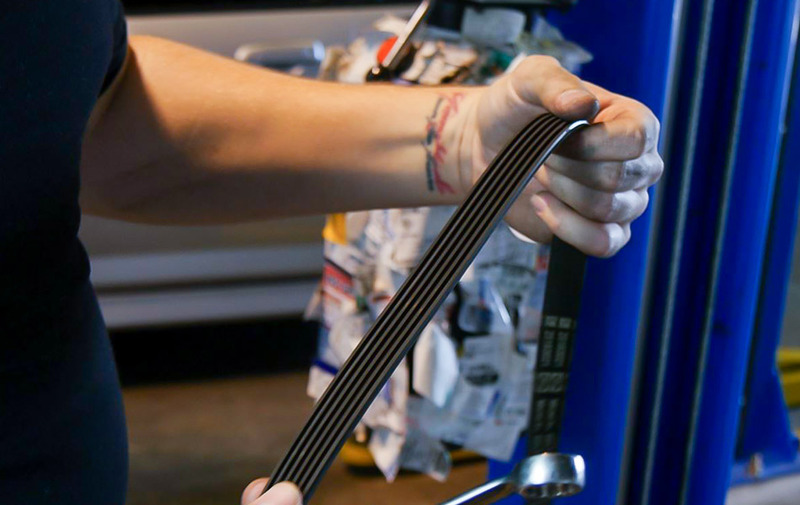 Why Is It Important to Have Your Drive Belts Inspected? The drive belt connects all the components to the engine and transfers the engines power to the accessories allowing them to operate correctly. The power steering, alternator, air conditioning, and water pump (on some vehicles), will fail to operate if there is an issue with the drive belt.This can lead to massive safety issues if left unchecked.